UFC® and FOX Networks Group Asia today announced a multi-year media-rights deal in the Philippines that will see the streaming of UFC’s 42 live events in 2019, including its prestigious Pay-Per-View (PPV) events and original programming, on video-streaming service FOX+. 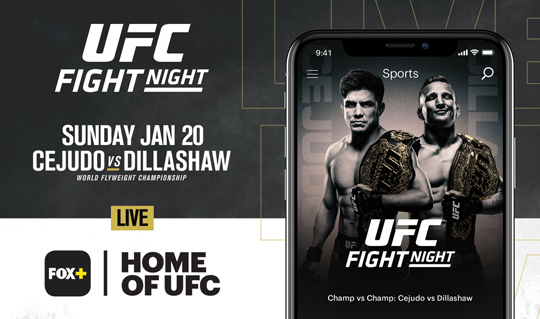 The first event is the highly anticipated flyweight championship superfight between UFC flyweight champion Henry Cejudo and UFC bantamweight champion TJ Dillashaw. It will be streamed live starting at 11:00 a.m. today on FOX+ with a catch up option post the live event. FOX+ is FOX Networks Group Asia’s video-streaming service available on Android and iOS devices as well as on Apple TV and select Android TVs. A free 30-day trial is available for new subscribers. “We are thrilled to extend our partnership with our long-standing partner, FOX Networks Group Asia,” said UFC Vice President APAC, Kevin Chang. “This agreement allows us to continue serving our passionate fans in the Philippines with the premier MMA programming in the world. The popularity of MMA continues to grow across Asia with UFC’s fan base in the Philippines increasing at an exponential rate,” he added. Chang further said that UFC social media accounts have also experienced tremendous growth over the past five years. With Facebook fans growing +107 percent and YouTube subscribers increasing by +1200 percent, these massive surges in consumer engagement illustrate the strength in UFC’s brand and the opportunity for further growth in the market.